Click on a name below for details. From left to right, Jeff, Lee and John. Jeff Berkey is the son of Attorney Jeffrey L. and Sherry Berkey. He recently graduated from Shanksville-Stonycreek High School in 2006 where he participated in Varsity Athletics, National Honor Society, Student Council, and Teens Against Tobacco Use (TATU). He will attend Juniata College in the fall to study Business Management and Political Science. He also plans to play basketball for the Eagles. 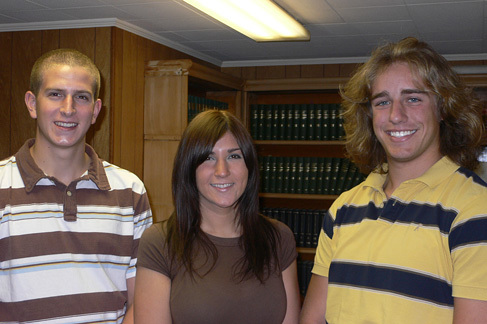 Lee Dirienzo is the daughter of Attorney John J. Dirienzo Jr. and Dr. Deborah Baceski. She is a 2006 graduate of West Virginia University with a Master’s Degree in Business Administration and 2005 graduate of the University of Pittsburgh with a Bachelor’s Degree in Psychology. She volunteers for the Somerset Therapeutic Association for Riding and the Somerset Humane Society. She will return to West Virginia University in the fall to further her education in the field of Biology and later plans to attend Medical School. ohn Cascio is the son of The Honorable John M. & Donna Cascio. He recently graduated from Somerset Area Senior High School in 2006 where he participated in the Honors Program, Varsity Athletics, and various clubs including Student Council, National Honor Society, Spanish Club, and Spanish Honor Society. As captain, he led his Varsity Soccer Team into the State Playoffs before losing in the quarterfinals to the eventual State Champions, South Park. He will attend Franklin & Marshall College in the fall to further his education in Government.